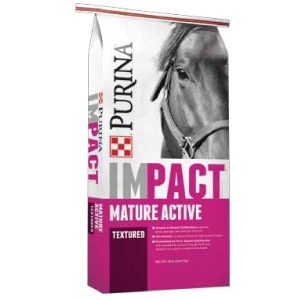 Support your horse’s active lifestyle with Impact® 10% Mature Active Horse Feed. Formulated with premium nutrition which provides the necessary calories and nutrients for mature horses at maintenance through moderate activity. 10% Protein for active horses on high quality forage. Added Beet Pulp provides high quality digestible fiber. Added Fat from vegetable oils for sustainable energy and a shiny hair coat. Vitamin & Mineral Fortification supports bone strength and immune function.